CitoPress-1 for hot cell is an automatic, electro-hydraulic hot mounting press for one cylinder. Complete with control box with electric parts and controls for rack mounting outside the hot cell. The system is cooled by the use of water or compressed air. The system is based on Struers’ standard equipment for precision cutting, hot mounting, grinding and polishing, which is adapted to allow remote operation and remote handling of specimens. The front panel and electronics are placed outside the hot cell. The distance between front panel and the equipment placed inside the hot cell is a standard 8 m. A selection of cable and tube lengths are available. The equipment is provided with rollers and handles to facilitate movement around in the hot cell. 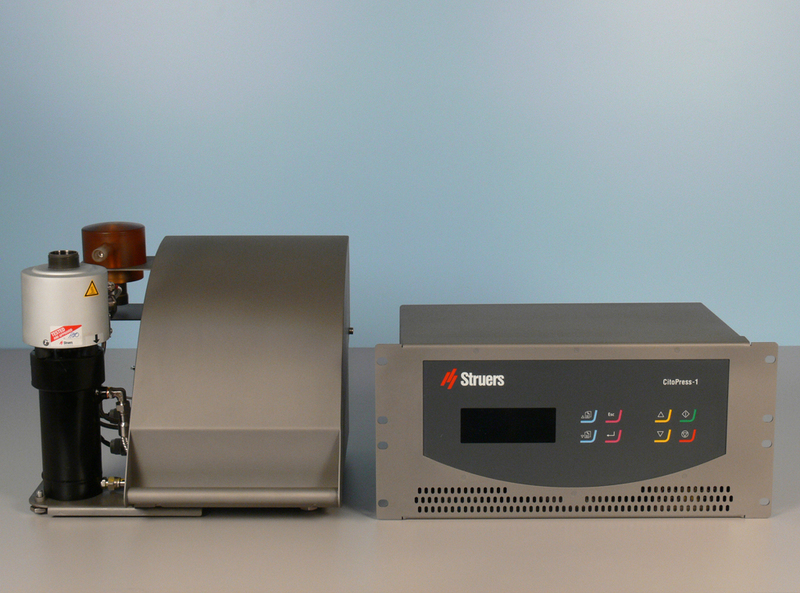 The equipment is adapted to allow remote operation and remote handling of specimens using hot cell manipulators. Control unit is separated outside the hot cell. 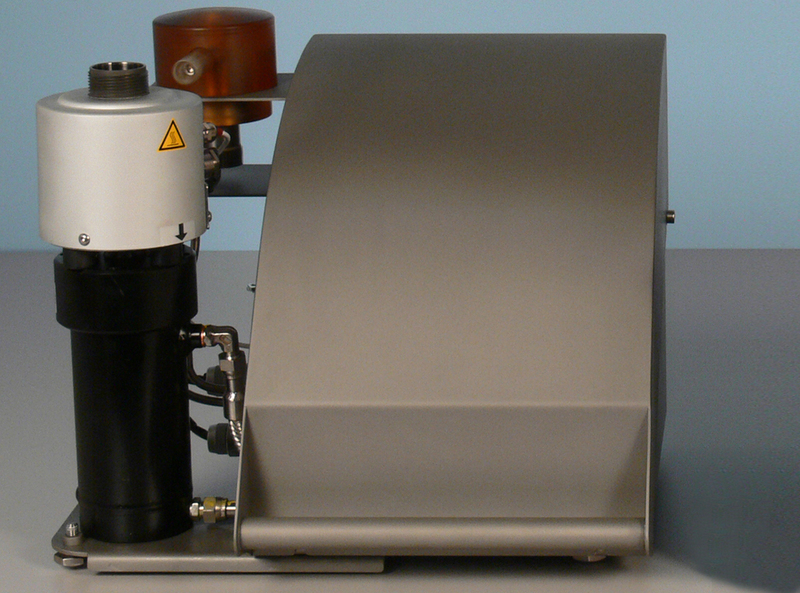 The apparatus features and functionalities match CitoPress-5. A sturdy, reliable design minimizes the need for service and repair. The equipment can be moved and turned in the hot cell for easy access. The cabinet is fastened by cylindrical Allen type screws, which facilitate removal. Electrical elements are connected by plugs for individual removal. Maintenance and exchange of vital parts including motors, belts and plastic tubes can be carried out in the cell using manipulators. 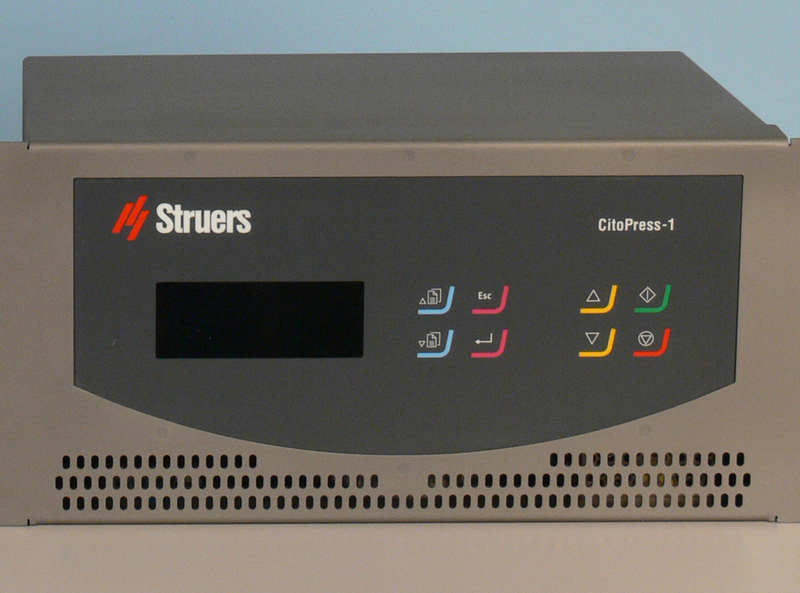 CitoPress-1 is controlled from outside the hot cell with touchpad controls placed on the front plate of the control box. The operation can be carried out in the cell using manipulators. The equipment has been prepared for various cooling options such as water recirculation or air-cooling and can be moved by lifting the front end. The electric parts are mounted in a control box with the normal touchpad front plate. This box is made for rack mounting, or it can stand alone. The mounting unit facilitates remote handling. The mounting unit can be opened, closed or replaced directly in the cell using the manipulators. Cooling is based on water or air. The plastic sections of the top closure are made from radiation resistant plastic. Whenever possible, plastic are substituted by metal and electrical parts are located outside the hot cell. 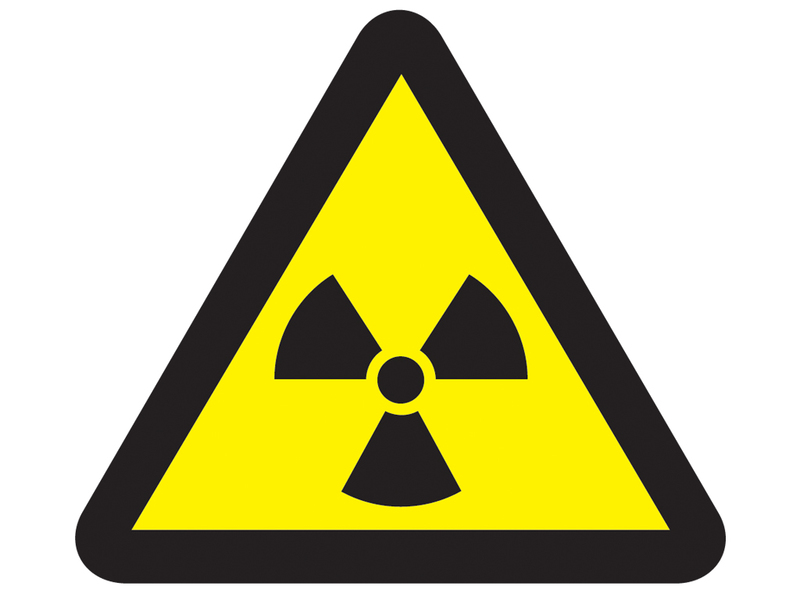 Gear wheels and belts are as far as possible made of radiation resistant material. The equipment can be repaired in the cell simply by using the manipulators, avoiding the necessity of discarding it as radioactive waste. The cabinets are made of stainless steel or aluminium with a suitable shape and surface treatment for easy cleaning. Automatic, electro-hydraulic hot mounting press for one cylinder. Complete with control box with electric parts and controls for rack mounting outside the hot cell. Cooling by water or compressed air. Mounting units are ordered separately. Length of supply cable is 8 m.
1 x 100-240 V / 50-60 Hz. 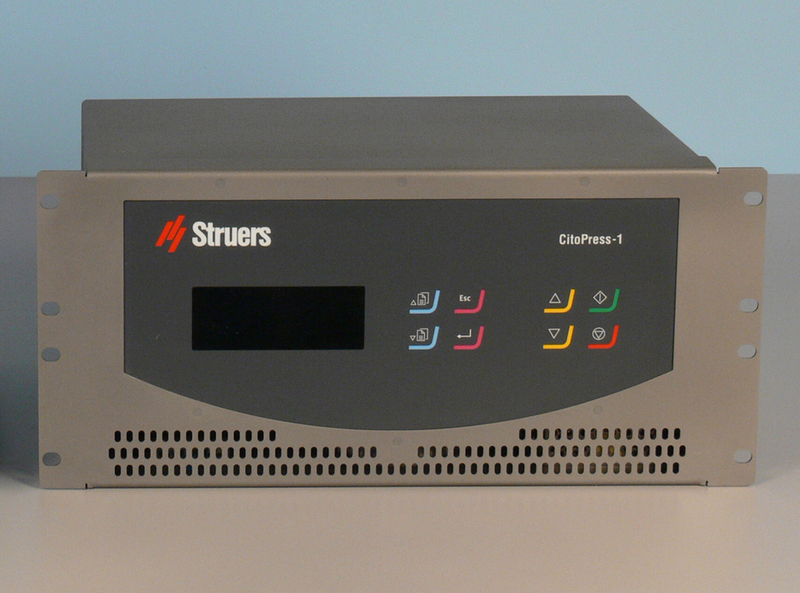 We are extremely satisfied with the highly competent service delivered by Struers. They always meet our needs quickly and efficiently. 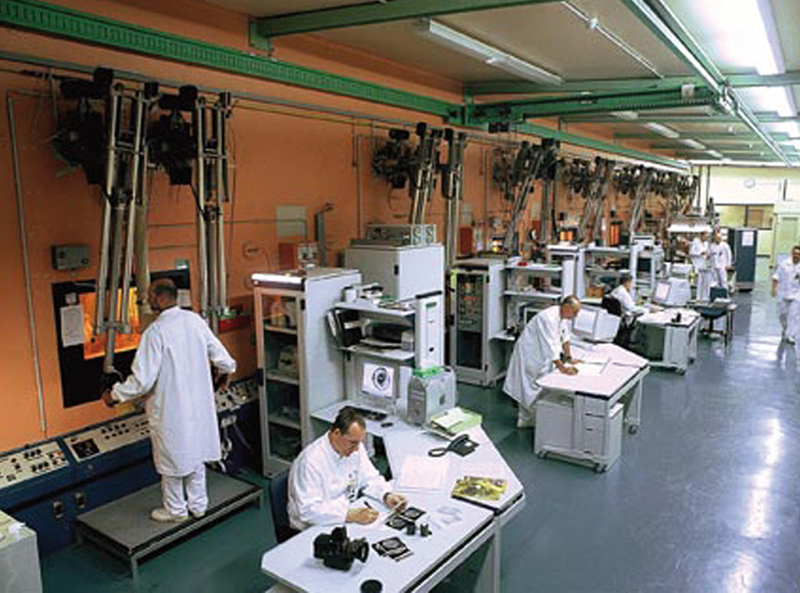 BRP Powertrain GmbH & Co. KG (Austria) Herr Thomas Brunmair Supervisor Material Lab.